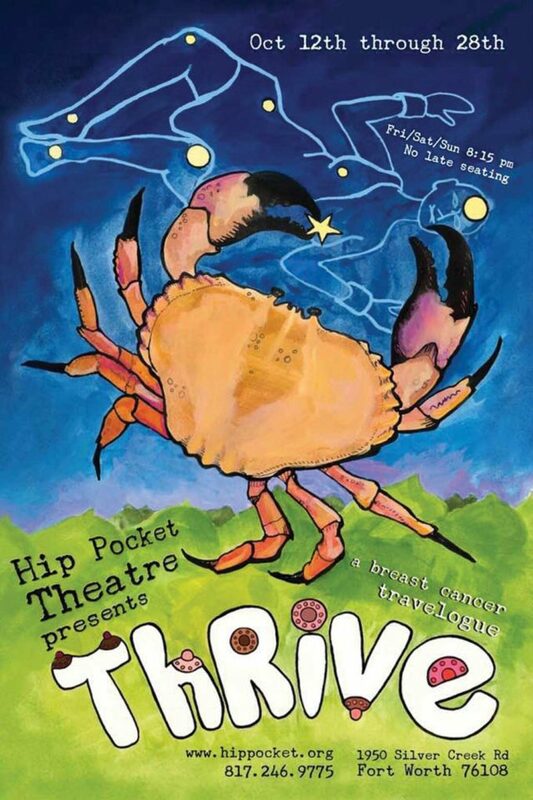 Thrive closes out Hip Pocket Theatre’s season. Wednesday 10 – Fort Worth Opera’s season is a long way away, but we don’t have to wait until April to hear the troupe. Singers will be on hand to perform Opera Shots “Unloaded,” a selection of arias and opera excerpts. You may prefer the cushy interiors of Bass Hall to the spartan surroundings of Shipping & Receiving Bar, but with the admission price, we’re going to spend our money on drinks. The event is at 6pm at 201 S Calhoun St, FW. Admission is free, though registration is required. Call 817-288-1214. Thursday 11 – As you likely know, the new Doctor Who Season Premiere won’t be just any incarnation, because the latest doctor is a woman played by Jodie Whittaker. We’ve been fans of the actress for years, and now this page can finally stop making the sarcastic “Doctor Who is always a white guy” jokes. The screening is at 7:30pm Wed thru today at various movie theaters. Check Calendar for locations. Tickets are $15. Call 818-761-6100. Friday 12 – Hip Pocket Theatre closes its season with a world premiere. Ellen Mahoney Crouse’s Thrive details the author’s experience of suffering from breast cancer through music, dance, and comedy. As is often the case with Hip Pocket shows, additional details are sketchy at this time, but it should make for a grand evening out. The show runs today thru Oct 28 at 1950 Silver Creek Dr, FW. Tickets are $5-20. Call 817-246-9775. Saturday 13 – So you missed Smoked BBQ Fest when it was in Dallas. Don’t despair, for the wing-ding of smoked meat and live music is coming here. Barbecue joints from as far away as Lockhart will be in Fort Worth to give out samples of their wares, and the musical guests will include Adam Hood, The Vandoliers, and Brandon Steadman. The festival runs 2-6pm in the Stockyards, 131 E Exchange Av, FW. Tickets are $10-96. Sunday 14 – If you crave the umami-malty-hoppy taste of a michelada, you should definitely turn out for the Fort Worth Clamato Michelada Festival. Besides those beer cocktails, the festival downtown will also have food from the likes of Yucatan Taco Stand, live music by Monica Saldivar, and dancing Spanish horses. The festival runs noon-8pm at General Worth Square, 900 Main St, FW. Admission is free. Call 469-389-0022. Monday 15 – Brahms and Debussy are about as far apart in classical music as contemporary composers can be, with the German prizing structure and line while the Frenchman obsessed over tones and colors. You’ll get to hear both of them when Spectrum Chamber Music Ensemble performs Debussy’s Violin Sonata and Brahms’ Viola Sonata and First Piano Trio at 7pm at First United Methodist Church, 800 W 5th St, FW. Admission is free. Call 817-377-0688. Monday 16 – We at Night & Day think that Confederate monuments honor a bunch of racists and traitors who tried to destroy America, but you’ll likely get a more nuanced view at Tuesday Evenings at the Modern, when artists Noah Simblist and Lauren Woods discuss the future of Confederate statues with historian Max Krochmal. It’s sure to be lively. The talk is at 7pm at the Modern Art Museum of Fort Worth, 3200 Darnell St, FW. Admission is free. Call 817-738-9215.